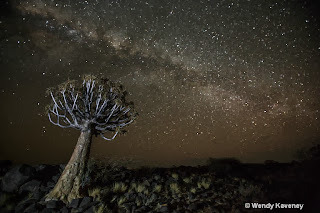 This is the first in a sequence of blogs highlighting the many places in Namibia which will be visited on the Strabo 2014 Namibia Photo Tour led by Brenda Tharp and myself. The images featured in my upcoming Namibia blogs will be from my most recent trip since the 2013 itinerary closely mirrored our Itinerary for 2014. 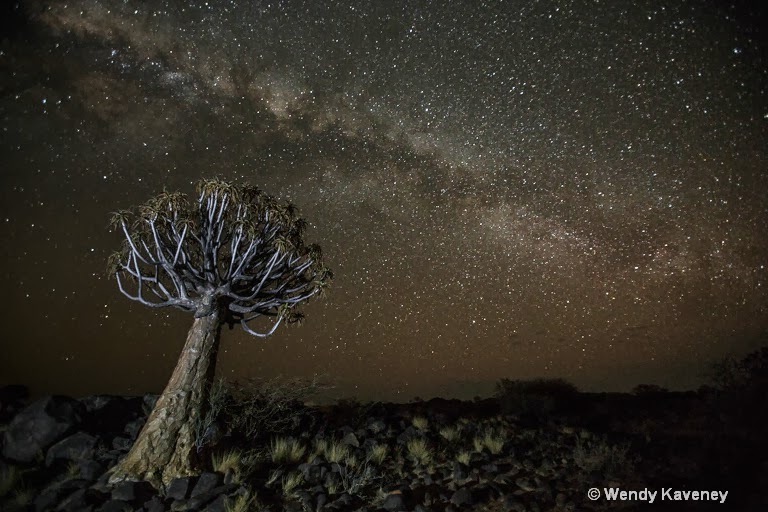 The first stop on our 2014 Namibian Photo Tour will be the Quivertree forest in Keetmanshoop. It is a very special place with numerous photo opportunities from grand landscapes, to wildlife, to tiny details and patterns. The quivertree is one of the most interesting plants of Namibia. But, it is not a tree. It is an aloe plant. (Aloe dichotoma) The plants are usually found growing singly but in some areas, like in Keetmanshoop, the quivertrees grow in large groups, giving the effect of a forest. 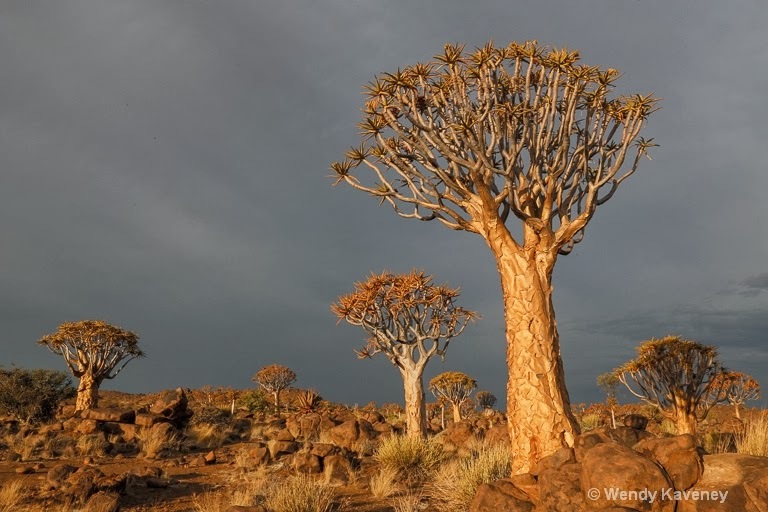 The Quivertree Forest in Keetmanshoop was declared a national monument in 1955, and the plants are protected by Namibian law. The largest trees in the forest are between 200-300 years old! Quivertrees, with their crowns of succulent star-shaped flowers, propagate only by seeds. 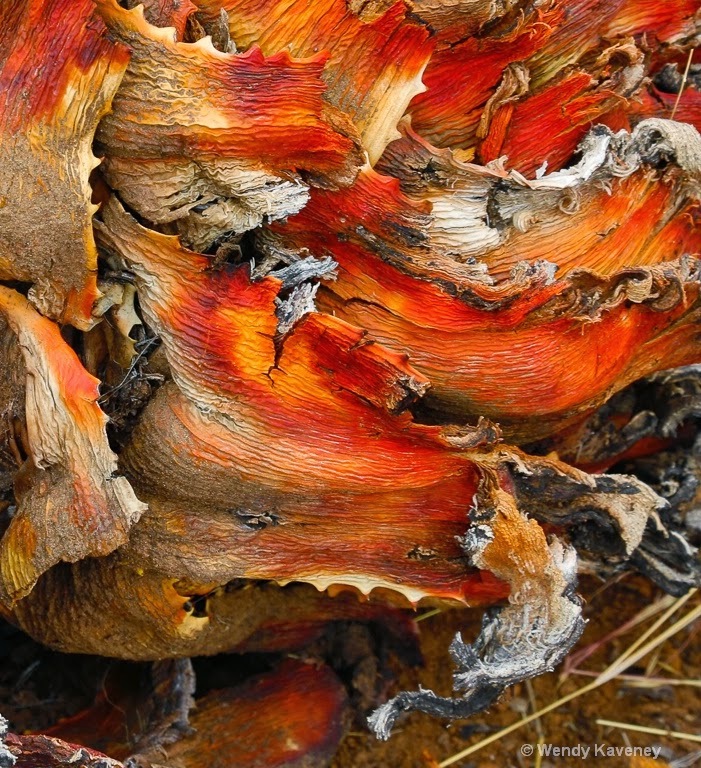 They have a spreading root system anchored in the surrounding black rock formations. The black rocks absorb the hot sun during the day and help protect the quivertees from frost on cold nights. 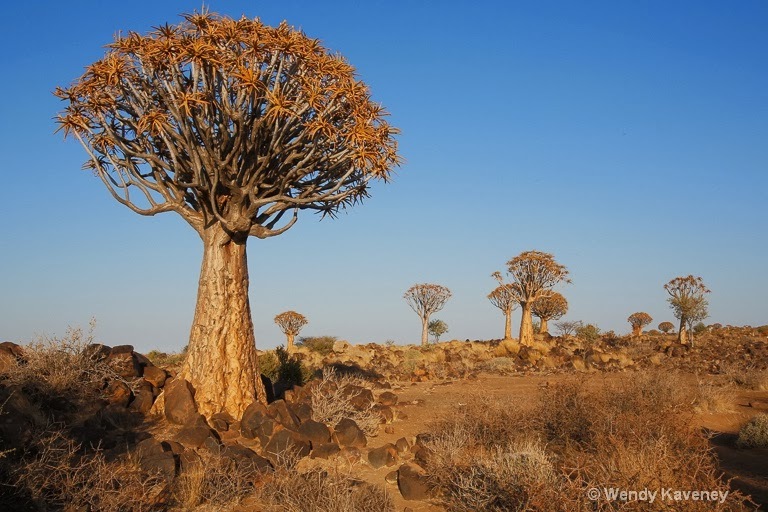 Quivertrees are called "Kokerboom" in Afrikaans. 'Koker' is the Afrikaans word for 'quiver.' 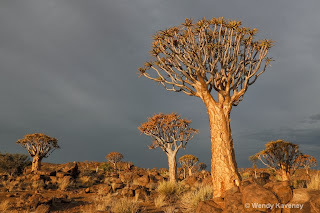 The name fits because Bushmen used the tough bark and branches of the quivertree to craft quivers for their arrows. Subjects and compositions are numerous in the forest. I found myself searching for foreground elements to anchor or to frame the grand scene. 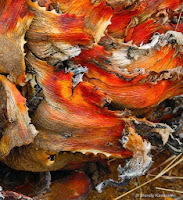 I also searched for patterns, colors, textures and designs to capture the forest's details. Our first cloudy afternoon in the forest was a perfect time for macro and details since the light was diffuse and the sky was white. Rock hyrax colonies are plentiful in the rocks and the small mammals pose motionless for potraits! One of the quivertrees housed a very large and active sociable weaver's nest, which kept my attention for a very long time as I tried capturing the small birds as they darted in and out of their nest and perched on the aloe flowers. Sunrise and sunset are magical in the Kokerboom Forest! As the sun rises and sets, the low angled rays make the bark on the trees glow amber in color. The trees cast long shadows across the dark rocks below. Because of the large range in tone, this location lends itself well to creating HDR (High Dynamic Range) images to feature the textures and patterns in both the highlights and shadows of the scene. We will be staying at the Quivertree Forest Rest Camp, which will give us the opportunity to access the forest at night. On a clear night, and at the right time of the night, the Milky Way can be seen stretching across the sky behind the towering Quivertrees in the foreground. Choose your widest lens to shoot the scene. In manual mode, set the camera for a 20-30 second exposure with the lens at its widest aperture (f2.8-f4.0) @ ISO 1600. Of course, a tripod is a must; and mirror lock-up and a cable release will help to minimize any camera shake. These settings are good starting point for making successful night images of the forest against a background of twinkling stars! Additional images of my 2013 Quivertree Forest visit can be seen on my web site in a new galley posted HERE. 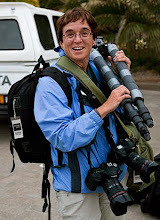 For more information and details regarding the 2014 Namibia Photo Tour, please visit Strabo Tours. Wonderful, Wendy! I especially love the abstract detail and the night sky with the 'trees'. exciting!